Montana voters chose Republican Greg Gianforte over Democrat Rob Quist in the special election to fill Montana's only U.S. House seat, meaning that the Democrats have lost the second of three U.S. House special elections since they lost the Presidency. This loss was despite - or maybe even because of - the fact that Gianforte shoved a reporter asking him questions about the health care debate in Washington. While a majority of the votes cast were mailed in in advance and it was too late for Democrats to capitalize on the issue, some progressives have charged that, had Democratic National Committee chairman Tom Perez gotten behind Quist early like he should have, Quist would be going to Washington and not Gianforte. But it turns out that Quist had feet of clay. According to the Billings Gazette, records from his home county, Flathead County, show that Quist has been sued by U.S. Bank after failing to pay back a loan and has been accused of fraud by a former bandmate in the bluegrass/country group Mission Mountain Wood Band, in which Quist became a local music legend. So, not only are the centrist establishment Democrats screwed up, so are the progressives who are trying (unsuccessfully) to take the party back. They can't even vet their candidates properly. It has become painfully obvious that the Democratic Party is no longer capable of getting its act together. Two-thirds of voters surveyed say the Democrats are out of touch with the American electorate - that's a larger percentage than the number of folks who disapprove of Donald Trump's performance as President - and the party still hopes to rely on identity politics going into 2020, dividing the country's voters of race, creed, and color . . . and if the gender card is played, deal Hillary back in - and claim that America can be great again when we are stronger together. Hey, Democrats - go to hell! My mother is exasperated with me for kicking the Democrats when they're down, but I can't think of an institution more deserving of a gutter kick. Look, I wanted to see the Democrats nominate a presidential candidate who could, you know, win, but the party tipped the scales for Hillary while it silenced her opponents for the nomination, dismissed anyone who was against Hillary as a bunch of malcontents, and ignored the party's in-progress collapse in down-ballot races despite warnings from Bernie Sanders and Martin O'Malley - two of Hillary's opponents for the Democratic presidential nomination - while offering nothing for the party's liberal wing. Then after Trump won, the Democrats put the same establishment jokers in charge of the party, and now even the liberals are coming up with substandard candidates for office who can't win to save their lives. Quist's ability to win more of a percentage of the vote in Montana than Hillary won in November 2016 is seen as a victory of sorts, but the truth is that he still lost! 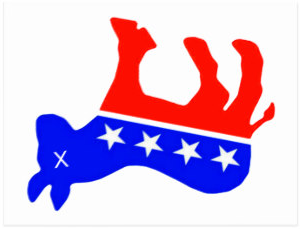 The Democratic Party is dead. Let it go the way of the Whigs. Come on, Tom Perez, admit it - your party is done! Pull the plug and put the party out of our misery.